The Midwest Critter Nation Habitat is safe and comfortable for your small pet and convenient for you to maintain. No tools are needed to assemble it. Interlocking panels secure the cage together without any screws, nuts, or bolts. It’s perfect for small animals, such as ferrets, hedgehogs, chinchillas, and rats. The sturdy square tube frame and wire construction provide maximum security, while the .5-inch horizontal bar spacing lets your pet move about and climb around easily with comfort. The attractive, durable platinum gray hammertone finish fits nicely into your home décor. 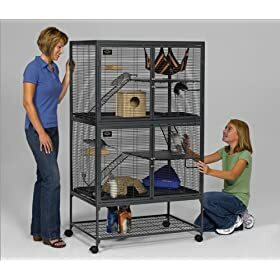 Full-width double doors let you reach into the cage for easy feeding and cleaning the adjustable shelves with removable plastic insert and the appropriately angled ramps designed specifically to protect your pet’s safety. Several anchoring points let you attach fun accessory items, such as toys, tubes, and hammocks. A wide-expanse shelf and full-width plastic pan floor prevents dangerous falls from damaging your animal. Keep the animal secure with the “critter-proof” dual-locking door latches you can operate with just one hand. Keeping your critters separated is easy with the swing-up ramps that lock into place to keep sections cordoned off. You can also use the ramps to put your animals together in one section, while you’re cleaning or feeding another section. The included stand allows you to raise the cage to a convenient height and wheel it around your home for the best view. It locks tightly into place and provides extra storage for food or toys. 36 x 24 x 63 inches. 97 pounds. Click here to Purchase!